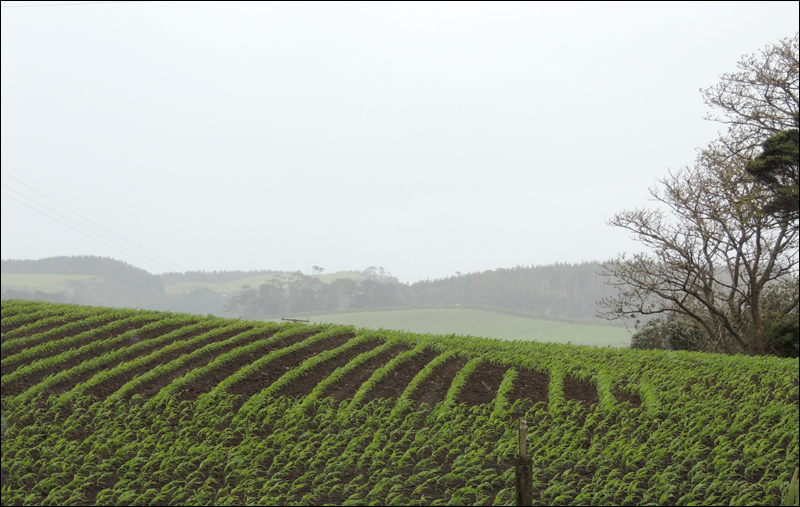 Rain is being blown across the paddocks, watering the maize. It was incredibly windy on Tuesday, with strong gusts blowing in from the west all day. It was also very sunny. Today, the wind is still howling and it’s bringing torrents of rain every 30 minutes or so. It’s noticeably cooler, too. Yesterday was a great day for the garden, despite the wind. I’d decided to dedicate a decent amount of time to tidying up and sowing some more seeds, so started around 9.30 am. The first thing I had to do was re-tie the young tomato plants to their stakes. They are hardening up nicely and the first two I planted out are flowering, but some of the spindlier ones were definitely being battered by the wind. New seeds have gone in between the beetroot and the carrots & peas. I then set to work tidying up a patch of the garden that had some bolting lettuces. After pulling them out and sifting through the soil, I sowed a second row of Edamame and a row of the heirloom carrot, ‘Touchon‘. I was reassured to see that despite the dryness of the surface, there’s still evidence of moist soil about a trowel’s depth in. On Sunday I had already sowed rows of organic Basil ‘Sweet Genovese’, Turnip ‘Golden Ball’ and Beetroot ‘Crosby’s Egyptian Flat’, so I’m feeling much better about the state of the vegetable garden. I don’t think I’ll ever get on top of the required tasks, though. The wonderful South Head growing conditions that produce so many vegetables, also produce weeds that grow with alarming vigour and scatter their seeds all year round. And there is never a frost to kill anything off. 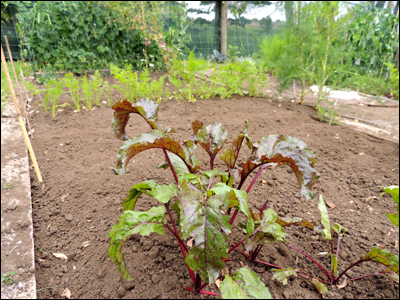 Beetroot (foreground), kale and broad beans. The vegetables are providing us with choices each day – it’s a matter of juggling between them all and trying to work out what we particularly feel like eating for any given meal. In the past week we’ve enjoyed Silverbeet, Asparagus, Kale, Lettuce (not just the green variety), Rocket, Broad Beans, Red Cabbage and Peas. 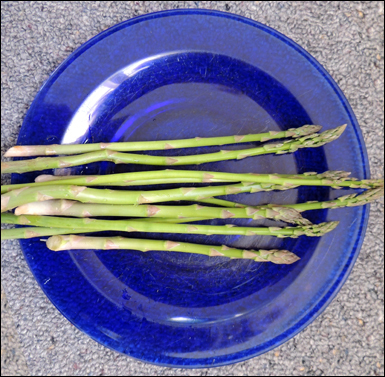 I couldn’t say which is my favourite, though I do love to have asparagus spikes every other day of the week at this time of year. 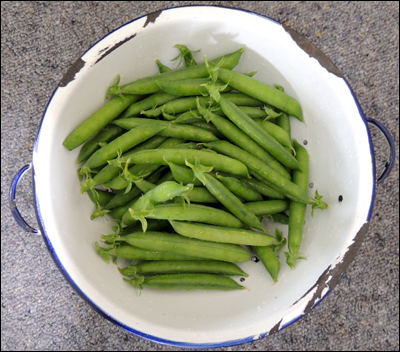 Close behind would be fresh peas, and tender young broad beans are wonderful, mashed up with butter and a little garlic. And I found a really easy (and yummy) recipe for Red Cabbage – so we’ve cooked this up a couple of times. I think this is on the menu for tonight, actually. Sautéed Red Cabbage. Florence Fennel (foreground) and Peas. 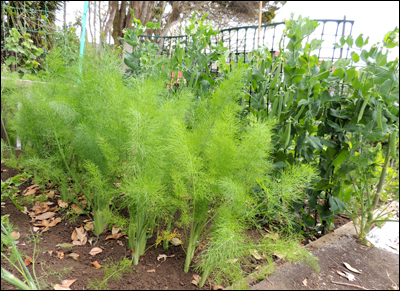 The Florence Fennel has been putting on a good deal of growth. Fingers crossed they won’t bolt before forming their bulbs. We’ve had good crops for several years now, and one that went straight to seed. You can see dried Lilly Pilly leaves in all my photos. They seem to fall at all times of the year and I’m always scraping them out of the garden in an attempt to keep it looking tidy. But I guess I’ll never have a tidy garden as the slightest breeze sends them showering back down. The runner beans seem a bit slow. Ben put in some ‘King of the Blues Runner’ in between the Scarlet Runners from last year. Scarlet Runners are perennial, although most people tend to pull them out at the end of the season and put in new seeds the following year. 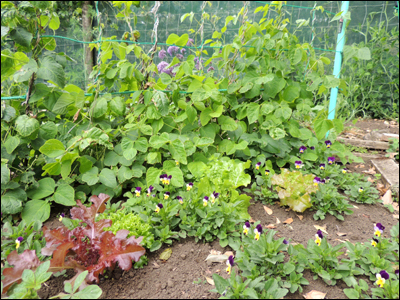 Growing in front of them are a few lettuces and some self-sown Viola Tricolor (Heart’s Ease). I poked around beneath the soil by one of the early potatoes and was pleased to see at least one beautiful new potato. It was quite a good size for an ‘early’ so I’m hopeful that we may have better luck this year with growing spuds. Ben hasn’t been so lucky with his sweet corn, though. He sowed a whole packet and only two sprouted. It’s hard to know if it’s something in the soil, or our friendly blackbirds have been in and dug them out. It’s disappointing and exasperating, but given that our back paddock has been sowed in a commercial crop of sweet corn and that we always get to help ourselves after the first picking, I’m philosophical about it. 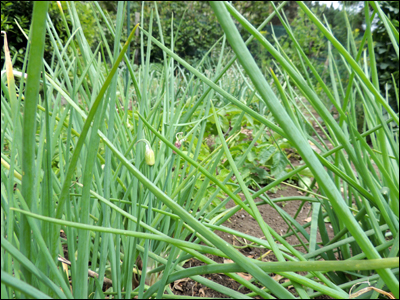 The Egyptian Walking Onions (also known as Tree Onions) are coming along well, forming the first little topsets at the end of their leaves. I’ll be glad to have these as I’ve had bad luck with trying to grow regular onions. The seeds have struck well enough, but have been dug up by birds before becoming properly established. 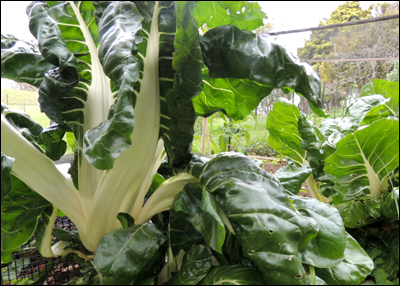 This Silverbeet never stops growing. 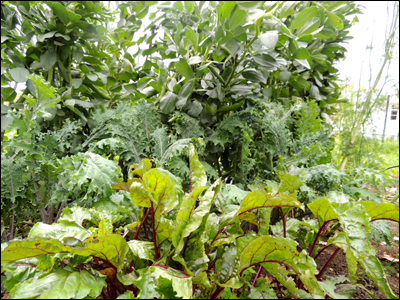 Our Silverbeet is amazing. These plants are a couple of years old, but don’t seem to want to go to seed. They have actual trunks now – somewhat like pyramids, with the leaves forming in a circle around the upper edges. A week or so ago I pulled off all the ratty leaves, thinking that we’d be pulling the plants out soon. They responded by sending out new glossy leaves, immaculate. We had to cook some up last night just to work our way through them. The ribs are so wide and the leaves so large that we can’t eat both. 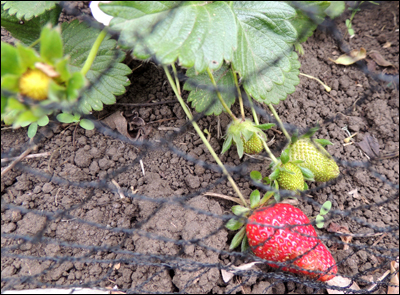 The strawberries, protected from the blackbirds. The strawberries have been coming along well. The problem with them (is there a common theme, here?) has been the blackbird hen. And probably a few other birds as well. Each morning I’d go down to the garden only to find sharp pecks in the strawberries – even before they’d ripened properly. I’m sure the hens were happy, though, as I’d throw them all the half-pecked fruit which they’d eat avidly. Ben’s built a clever frame with netting to keep the birds off, so the berries are having a chance to ripen and be eaten by humans, rather than birds. We’ve probably picked around a kilogram so far. 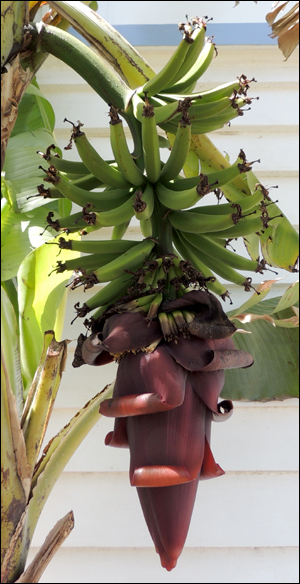 The bananas are also looking good. They seem to be forming better than the ones from earlier in the year – perhaps due to the improved growing conditions. It’s warm, and we’ve had a good deal of rain compared to a year ago. Blackbird hen, back on the nest. Speaking of the blackbird hen, she’s back on the nest again! 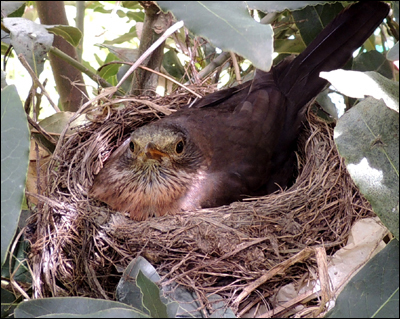 This is the same nest she used to raise her last batch – built inside a small Sweet Bay tree situated within our fenced-off vegetable garden area. I took the above photo yesterday and had to poke the camera in quite far as it was so windy that the branches were being rocked and shaken. As you can see, she stares steadily out at you, but doesn’t budge. Not that I’d want her to – and I tried to be as quick as I could as I’d hate to put her off her task. Despite the damage the birds do to our garden we do love having them here. They are so tame and so pretty. We regularly see two or three young birds from her first brood. They have grown from chubby little birds with short tail feathers and speckled breasts, to much sleeker specimens. And where originally they weren’t very skilled at flying, they are now adept. 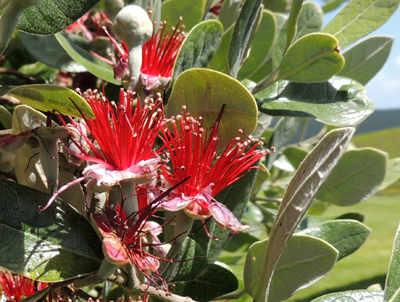 Feijoa flowers are irresistible to birds. We don’t see the male (father) blackbird very often, but the hen and young ones are often in the Feijoa, eating the crimson flowers. I was worried about this until I read that birds eating the petals help pollinate the flowers. However, it seems to me that the birds not only eat the petals but destroy the whole flower. Often the complete flower drops to the ground and the bird will fly down and finish it off there. I guess time will tell. 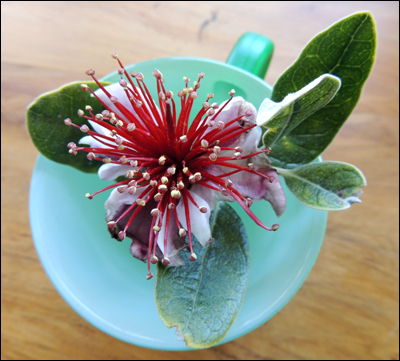 The other thing I read with interest is that the fleshy petals of the Feijoa flower are edible and can be sprinkled in salads, etc. I decided to check this out this morning (even though I didn’t want to remove a potential Feijoa) and can confirm that they have a pleasant taste. They are more fleshy than they look, so have a bit of texture to them, and have a delicate sweet and spicy flavour. No wonder the birds like them! Here’s another member of the Bromeliad family that is currently looking good in the garden. I love the way water collects in the centre of the leaves. 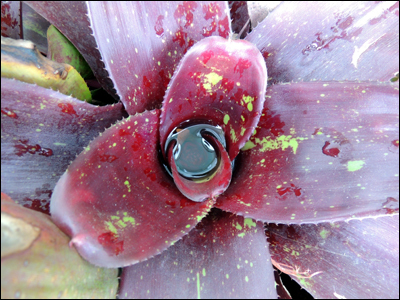 Neoregelia are native to the South American rain forests. I’m pretty sure that this particular specimen is Neoregelia ‘Everlasting’.